Home SEND Accountability Ofsted and CQC report on one year of SEND inspections. It isn’t pretty. Yesterday we ran a disturbing survey saying two-thirds of school leaders didn’t feel they were sufficiently supported to give the best help to children with SEND. 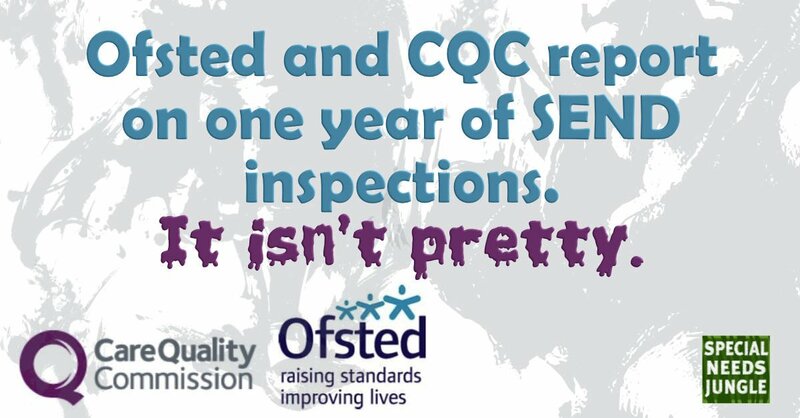 Hard on its heels, yet a little early for Hallowe'en, came Ofsted and CQC’s grisly report on the first year of local area inspections of the SEND reforms. And it too makes for pretty grim reading. This article is quite long but hopefully well-laid out and keep with it, for some important news at the end. The Ofsted/CQC Inspection Framework didn’t even get underway until two years after the reforms were implemented. So LAs, social care and health authorities had two years to get their act together before they came under any measure of scrutiny or accountability. Or, you could say, that without proper scrutiny from day one, it allowed poor practice to get worse and there was a lack of guidance to get them following the letter and spirit of the Children and Families Act 2014. Depressing, but there you are. In this past year, the teams of inspectors from education watchdog Ofsted and health CQC have visited a fifth - 30 out of 152 - local authority areas in England. Of these, nine were ordered to write a written statement of intent for how they were going to pull their socks up, sharpish. We believe that many others got off very lightly after responses from parents to their local reports. What does the Ofsted/CQC SEND inspection framework do? outcomes for children and young people who have SEND . Of course this report is too long to feature it all, but I will try my best to give the headlines. Children and young people identified as needing SEND support had not benefited from the implementation of the Code of Practice well enough. The report said children and young people had a much poorer experience of the education system than their peers and too often, local area leaders were not clear how their actions were improving outcomes for those needing SEND support.. However, in some of the more successful local areas,, effective strategies had led to improved outcomes for those identified as needing SEND support but who did not have an EHC plan . This was particularly the case when leaders in education,, health and care settings worked together under a shared vision to improve joint working for children and young people who have SEND and their families. Also read: Ofsted/CQC SEND Inspections and Parents: More Than A Feeling? Children and young people who have SEND were found to be excluded, absent or missing from school much more frequently than other pupils nationally. School and area leaders did not have appropriate plans to deal with the levels of exclusion and had used unofficial exclusions too readily to cope with children and young people who have SEND. An "alarming" number of parents said they’d been asked to take their children home. This was in addition, or as an alternative, to fixed - term exclusions. It is illegal. Access to therapy services was a weakness in half of the local areas inspected. Typically, therapy services were of high quality. However, too many children and young people who have SEND experienced long waiting times as well as limited contact with the therapists that they needed. Funding challenges and empty posts meant therapy services were too overstretched to deliver what was needed in their local areas. This led to unacceptably long waiting times for the children and young people and their families. Access to child and adolescent mental health services (CAMHS) was poor in over a third of local areas. Many parents reported that the threshold to access CAMHS services was too high or waiting times too long. Consequently, too many children and young people identified as having social, emotional or mental health (SEMH)) needs did not get the right support until they were in crisis. Some local area leaders had identified the need to implement new strategies to support children and young people’s mental health, particularly in schools. However, even where this was the case, strategies were yet to demonstrate an impact. TT: Again, this is pretty shocking considering all the hoo-ha about the “Future in Mind” launch and all the big money announcements made by the government. What’s happening to it all? Not enough progress in implementing a coordinated 0–25 SEND service. In particular, the commissioning of health services for up to 25 was inconsistent. For example, in some local areas, therapy and school nursing services had only been commissioned for up to 19 year olds. In other local areas, there was a lack of coordinated planning as young people moved into adult services. Consequently, too many young people who have SEND did not get the support and resources they were entitled to once they reached the age of 19. The proportions of young people who have SEND who are not in education, employment and training were low, particularly for those who ha d an EHC plan. In 12 of the 30 local areas inspected, inspectors identified a strength in how leaders had secured appropriate education, employment and training post-16. Weaknesses in a large number of EHC plans, or delays in transferring statements to EHC plans, were found to have a negative impact on many young people who have SEND when they reached the age of 19. In particular, a lack of clarity about young people’s aspirations and poor detail about the provision that was needed post-19 in EHCPs left ambiguity about who should be providing what for young people as they leave school. In many local areas, a lack of choice for young people, alongside a poor understanding of how personal budgets could be used, limited what was being offered. These issues were exacerbated by insufficient progress in commissioning and providing transition into adult services. SEND was identified well in the early years, particularly for those with complex needs and parents generally felt supported and involved in the process. However, the further through the schooling system children progressed, the less established opportunities for education, health and care professionals to work together became, particularly in mainstream schools.. This meant that for children and young people whose needs were more subtle, the likelihood of these needs being identified quickly and accurately reduced significantly the older they got. The autism diagnostic pathway commissioned in most of the local areas inspected was poor. This was particularly the case for children and young people who were referred for assessment when they were school-aged. In some local areas, families experienced unacceptably long delays between an assessment being agreed and a diagnosis. In the worst cases, families waited for over two years. Families described becoming even more frustrated and sometimes isolated, with little or no support. In many cases, the lack of support continued post-diagnosis. In over a third of the local areas inspected, leaders across education, health and care did not involve children and young people or their parents sufficiently in planning and reviewing their provision. In particular, there were weaknesses in co-production during the statutory assessment and annual review processes, including when statements of special educational needs were converted to EHC plans. Many local area leaders were unaware of the depth of frustration among local parents and what their concerns were about. Some parents reported a much better experience when working with professionals to plan improvements to local services. However, parental dissatisfaction was often a significant factor when inspectors judged that a local area should submit a written statement of action. TT: I find this astounding – it speaks to a massive disconnect between LA service heads and their case workers who must surely know of parental unhappiness. The statutory assessment process was not working well enough in just over two-thirds (21) of local areas inspected. Common weaknesses were securing the statutory contributions from health and care professionals to assessments. Consequently, the quality of EHC plans varied considerably both within and across the local areas inspected. This is no surprise – how can you make an assessment process much more complex by and yet give six weeks less to get it done? Would parents mind a process that was six weeks longer if it got their child a thorough and well-constructed plan? Let’s face it, they’re waiting upwards of a year for a pretty rubbish one at the moment. Local offers were not effective in helping parents to access information and services in over half of the local areas inspected. Local area leaders had not promoted their local offers well enough to parents or to frontline staff. As a result, very few parents used their area’s local offer to access the information they needed because they were unaware that the local offer existed. Local area leaders have had varied success in securing the use of personal budgets. In some local areas, leaders have supported families by allowing a freer approach to how personal budgets can be accessed and used. However, in just under half of the local areas inspected, there were less than five personal budgets allocated. In three local areas, there had been a zero uptake altogether. Typically, this had been as a result of difficulties in developing a cost - efficient way to balance parental choice with constrained budgets. TT: In other words, there is a distinct lack of will and imagination to do it. A large proportion of parents in the local areas inspected lacked confidence in the ability of mainstream schools to meet their child’s needs. Many parents of children or young people who have SEND reported concerns about the quality of staff training and teachers’ ability to meet their child’s specific needs when in mainstream school. Too few school staff had the knowledge and skills to identify accurately when children and young people who are struggling in school needed further assessments. Poor joint-working arrangements between education, health and care for school-aged children and young people meant that the opportunity to get a holistic picture of their needs was not used in the way seen in the early years. TT: And this is one of the biggest reasons why applications for EHCPs have been rising exponentially. Not only do parents fear the ‘one-size-fits-all’ mainstream inclusion model isn’t working through lack of staff training, funding cuts of support staff (as highlighted in yesterdays’ report) means that parents have nowhere left to go other than to seek the protection of a legally-backed EHCP to ensure their child gets the help they need – or so they can use it to get them a place in a specialist school. The quality of EHC plans varied widely. Many did not provide the holistic view of the child’s needs or of the desired outcomes across education, health and care that the reforms within the Code of Practice have been designed to secure. For example, too many EHC plans were focused almost entirely on educational outcomes. The outcomes themselves were often too general, for example making broad statements about improving independence. They lacked ambition for the child or young person. Jargon meant the plans were not accessible to the children and young people for whom they were intended or their parents. In the most effective local areas, strong strategic leadership had led to established joint working between education, health and care services. This underpinned their success when implementing the reforms of the Code of Practice. In successful local areas, leaders’ strategies were based on thorough evaluation s of the effectiveness of services in improving education, health and care outcomes.. Leaders focused on improving the impact of joint working across services to ensure that they could improve outcomes in areas of weakness. For example, giving the designated medical officer ( DMO)) or designated clinical officer (DCO)) sufficient time, resulted in improved joint commissioning arrangements . Children and young people who have SEND and their families typically had good access to high - quality short breaks. Inspectors found only one local area where access to short breaks was weak. TT: Although with budget cuts, this is something that needs to be kept a close eye on. Similarities in areas who were told to produce a written statement of action. Leaders’ strategies to implement the reforms were weak and lacked impact. This included the role of the designated medical or clinical officer, which meant leaders were unable to succeed with collaboration, This then impacted on commissioning between professionals from education, health and care leading to poor delivery of any central strategy by frontline staff and no coproduction with children and families. Consequently, EHC plans in all nine areas were weak with poor outcomes and mainly only education-based. Leaders’ evaluations of the effectiveness of their services did not focus on improving outcomes for children and young people with SEND . Elected council members were not holding local area leaders to account well enough, meaning a lack of leadership scrutiny. The weakness in access to specialist and therapy services was more pronounced in the nine local WSOA areas. Parental dissatisfaction was a main weakness in the majority of the nine and leaders’ engagement with parents was particularly poor. Disputes during the statutory assessment process were not resolved well. Parents reported an apparent lack of transparency in decision-making processes and that they were not listened to, particularly when they disagreed with a course of action. So if your area hasn’t yet been inspected, it is very worth reading this, especially the last part, and asking yourselves the hard questions – is this us? If you’re not sure, ask parents. 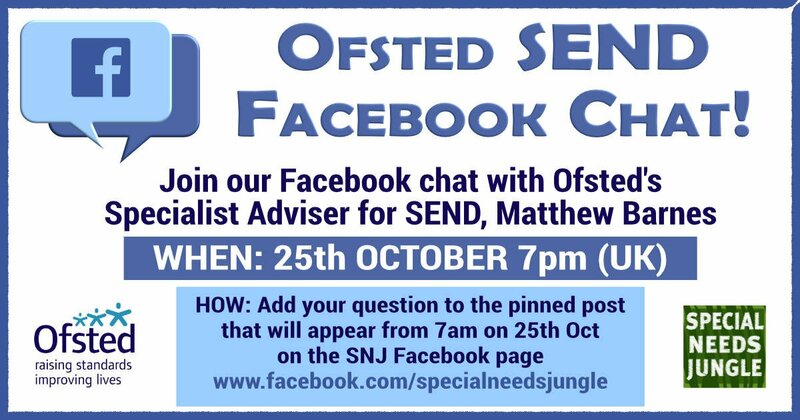 Next week we are hosting a Facebook chat with head of Ofsted's SEND inspections, Matthew Barnes. Stay tuned for more details on Monday on how you can participate. Additionally, I'm delighted to say I've been invited to sit on a new LA SEND External Stakeholder Feedback and Evaluation Group, headed by Matthew Barnes. First meeting is next week. I will keep you posted. Hope your Facebook page fairs better than the CQC/Ofsted inspectors’ webinar technology which crashed when they opened up to Herts parents. Such was their enthusiasm! Well, it’s Facebook, so it should do! Hoping my tech holds out: hols in Devon,, still can’t get reliable 3/4G in parts of UK! Does anyone know how often the already inspected local authorities will be inspected is it yearly, a one-off or something else?